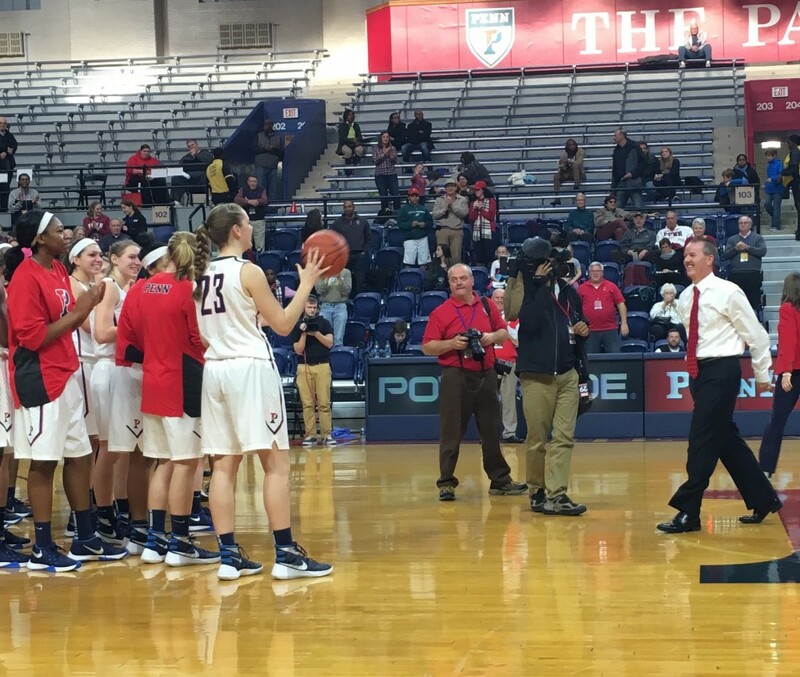 Mike McLaughlin throws the game ball to his team after winning his 500th career game Saturday at the Palestra. Moments after Penn beat Drexel in a Saturday afternoon women’s basketball contest, you wouldn’t have known Quakers head coach Mike McLaughlin just hit a very big milestone. It was only after the handshake line that his players came over to mob him for one large group hug. Then came the announcement over the PA system: McLaughlin, who’s only in his mid-40s, had just won his 500th career game as a head college basketball coach. Even that, though, was too much for the modest McLaughlin, who tried to deflect attention away from himself after his players dug deep in the final minutes to pull out a hard-fought 72-67 win over neighborhood rival Drexel. Of course, the players all wanted to keep the focus on their coach. That included star junior center Sydney Stipanovich, who poured in 27 points to help the Quakers improve to 6-2 on the season. The fact that McLaughlin already has 500 wins is nothing short of remarkable. The fastest coach in the history of women’s college basketball to reach 400 wins, McLaughlin did most of his damage at Holy Family but has continued to rack up the victories since getting hired by Penn seven years ago. McLaughlin, who had a whopping overall record of 500-150 in 21 seasons, is the 30th active Division I head coach to reach the milestone. Considering he could easily coach another 21 seasons, you have to ask: can he win 1,000 games — an achievement that right now only belongs to the legendary Pat Summitt in the women’s game? “Oh, I don’t know,” he laughed. “My insides can do it but I don’t know about my outside.